For the last 3 months I’ve been working with a client’s dominant and aggressive two year old filly. This filly went into season a few days after she arrived for training and her disposition got worse as she would pin her ears charge at the fence and rear up at me. I also noticed that she would exhibit the same type of behavior with my horses who were on the other side of the fence from the mares to the geldings. Now I knew from the beginning that this filly’s Dam is also dominant and aggressive and her Dam was also, so she came from a line of dominant and aggressive mares. I suggested to my client that there might be a possibility that this filly had a hormonal imbalance and that could be some of the cause of her belligerent behavior. From my experience when mares act like this I usually see the horse given a synthetic form of progesterone which I am not a fan of as I’m more for going with natural alternatives so there is no side effects. My suggestion was to try a couple of different herbs which my client was very open to trying with this filly. I suggested Extra Calm and PMS (Painful Mare Soother) the PMS is know to balance the hormonal system. After 7 days of being on these two herbal products the mares disposition started to improve as I saw less ear pinning, charging, rearing as she was able to calm down and start thinking before reacting. I am now able to walk beside this filly without a halter on and she is calmly walking beside me without trying to attack me. Do not think that the herbs are a fix all solution because like I stated earlier this filly comes from a line of dominant and aggressive mares and I can’t change the genetics of bad breeding practices. I urge those of you how are breeding to pay close attention to the disposition of your mares and stallions as this can be passed along to the foal and right now there is an over abundance of horses. This filly will have to be with someone who is an expert horse person and even then she is one that you will always have to keep your guard up. 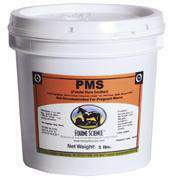 If you found this information helpful check out the product page where you can place your order for the “PMS” for your mare.